Cute, cuddly, and a potential nightmare for your wood flooring! Read more on how to protect your wood floors from pet damage. Your hardwood flooring is one of the most beautiful parts of your home, but it’s also one of the most difficult things to protect. Aside from sun damage and wear and tear, pet damage can also wreak havoc on hardwood flooring. Luckily, there are a few simple ways to keep your hardwood flooring protected from pet damage. Dogs are not the tidiest eaters and drinkers, so invest in a few high-quality waterproof mats to place between pet bowls and the hardwood flooring beneath. Many homeowners forget this step or see it as unnecessary and deal with unsightly water damage and discoloration in the future. Always mop up any water that spills onto the floor before it has a chance to soak into the hardwood flooring. If you take a little bit of effort every day to keep the hardwood flooring clean and dry, it will definitely pay off in the future. 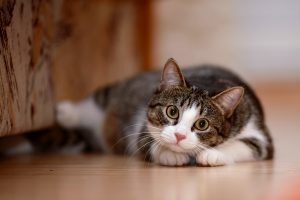 This is one of the most common causes of pet damage to hardwood flooring, so take the time to trim your cat or dog’s nails regularly. Without noticing the damage that they are doing, your cat or dog will dig their nails into softer woods to gain traction. Whether it’s the mail truck driving by or your son arriving home from school causing your pet’s excitement, nail scratches can cause a lot of damage in a short amount of time. Unfortunately, pet urine is unavoidable when you have a young animal that is not yet toilet-trained. Pet urine causes immediate damage to hardwood flooring that is almost impossible to reverse. Even worse, many times the pet damage compounds, as your dog or cat will use the same spot again once it has been marked. Clean up pet urine as soon as you can so that smells and discoloration won’t occur. This entry was posted on Friday, June 23rd, 2017 at 9:57 am. Both comments and pings are currently closed.